A few weeks ago Peppersmith were offering a free sample via Twitter so I signed up and received the Lemon and Eucalyptus mints. Peppersmith products are free from artificial colours, flavours, preservatives, aspartame, animal derivatives and suitable for Vegetarians and Vegans. The Eucalyptus mints packed a punch with a strong distinctive flavour. I personally preferred the Lemon mints. These are light, refreshing and a little different to other mints I have tried. 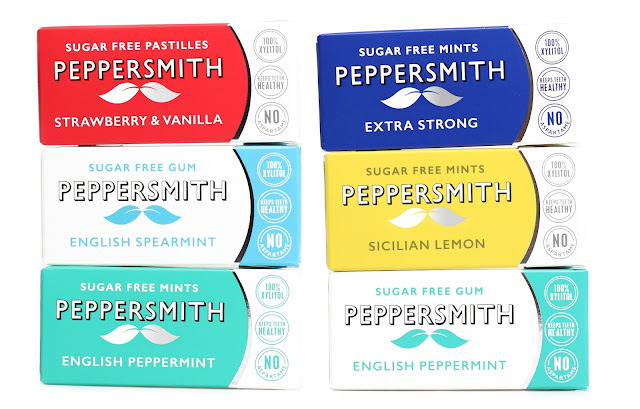 Peppersmith also have chewing gum if mints are not your thing. You can order online and I have seen them stocked at Holland & Barrett. Updated in 2018 - still buying Sicilian Lemon! we have a reasonable range of options in the supermarket for vegetarian sweets but if you are strict vegan those ones are harder to find.